I’ve let my New Yorker subscription lapse recently and not because I don’t enjoy reading this entertaining and smart magazine. Politics, literature, reviews, humor… it’s all there. The problem for me… it’s sort of too all there. As a weekly jam-packed text-heavy publication, TNY tends to pile up on the dining room table, leaving me with feelings of intellectual laziness and/or guilt. Confession: Sometimes I just read the cartoons. (Come on, so do you!) Look, I’m a busy mom with a job and a half… give me a break! I just don’t have time. But make no mistake, I love The New Yorker. One thing I actually often make time to read is the front section that describes the goings-on at the NYC galleries, movie theaters, etc. It somehow makes me feel connected to, if deeply lonesome, for the great city where everything happens about a year before it hits DC (if it hits at all). 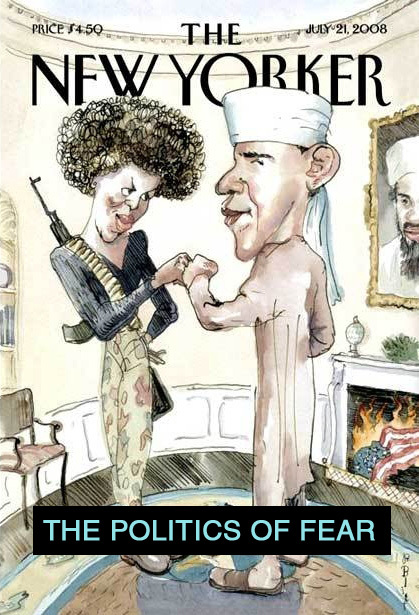 Oddly, my subscription seems to have ended with the controversial Obama + Michelle as Islamic Terrorists cover. The mag wasn’t in my mailbox this week, so I heard about this from my mom, pulling up the image later on my computer. So, we’ve established that I am a TNY magazine reader and bigtime fan. For the purposes of this essay, let’s also just go out on a professional limb and establish (in case it’s a secret, ha!) that I am also a political progressive. Very left of center. I like Obama and I want him to win the Presidency. There you have it, my cards are on the table as I am about to offer a bit of harsh criticism to my beloved TNY. What I’d like to say simply is this. MEMO TO THE NEW YORKER MAGAZINE: WHAT WERE YOU THINKING??! AND &%$#!@. 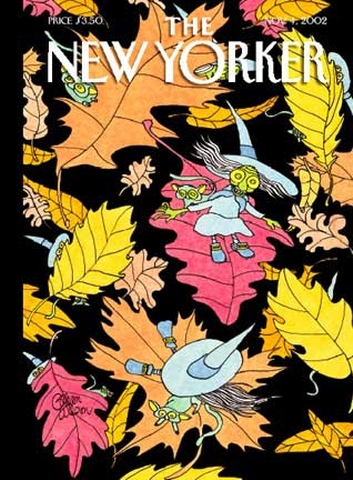 What I’m going to say instead is: The New Yorker covers, and not just this one but particularly this one, often suffer from a big failure of communication, a failure of design and marketing. A big fat FAILURE OF MESSAGE CLARITY. Shame on you TNY. You are much too sophisticated for that. Aren’t you? If you know the magazine, you know that the cartoons are often satirical. Heaping dollops of irony. A long time ago, I felt intellectually ashamed when I didn’t “get” a TNY cartoon. What was I missing? More importantly why was I missing it? I’m smart, political, savvy and cool… why don’t I understand the humor?? Is it because I didn’t go to Harvard or Yale? Later I realized, it’s a running joke among readers: While some cartoons are quick and easy, and laugh-out-loud funny, others can be so obtuse that the humor is buried under such opaque layers of literary or political or some other reference that most people aren’t getting the joke. Whew! The covers, which are marketed and sold by the magazine as framed works of art, employ illustration, a graphical tool that brings point of view into play automatically by its very nature. Sometimes the illustrations are simple, a gently sweet comment on the season. Here is one such cover from 2002 by Gahan Wilson. Easy peasy, right? My 10 year old would “get” this, and importantly: NO caption is needed. We all get it: Fall, Halloween, witches, broomsticks, etc, whatever! There are many many such TNY covers. Friendly, easy non -satirical, non -ironical subjects. Treated non- satirically and non- ironically. Played straight, by the art director and the illustrator, who have worked together to come up with the image. The message, if there is one, (It’s Fall! Enjoy!) is clear. But the covers are not always lacking in social and political commentary. Here is another, from 2007 by Anita Kunz. And now we should tell you something else about the TNY covers. Each cover, each illustration actually has a caption, a title if you will, but this text is nowhere in sight. You will have to look very hard to find this title, it’s on page 3 or 4, tucked in with the Table of Contents and in rather small type. Are you beginning to see a problem here? W/r/t the cover above… I think I get it and you probably do too. But I’m not 100% sure. Clearly, this image is a commentary on religion and women, sexuality, freedom of expression, east, west, and… maybe, California? But, who is the blonde? Frankly, at the risk of admitting my ignorance here… I am thoroughly unsure if she is someone specific, perhaps some political scandal chick, vs. a generic representation of free-wheelin’ Western (or at least rumored and depicted as such) feminine sexuality and bodaciousness. I just don’t know. I’m simply not sure. I’m sitting here thoughtfully considering it… and I’m still not certain. If I walked past this image on the newsstand, it would register quickly and with no small amount of blurred uncertainty. Just what is the New Yorker trying to tell me? What is their position? What are they promoting, supporting, criticizing? WHAT IS THE MESSAGE? I’m left in my intellectual wonderland. And perhaps so are you. As is the rest of the world, because this is a globally published image. I found it in about 3 seconds with the help of Google. The point, dear consumers-of-good-design is this: When text and images are not handled intelligently (no matter the intelligence of either or both), responsibly, hierarchically and with regard for BASIC principles of graphic design… it can be, and sometimes is, a very dangerous thing. Finally, way down here at the bottom of my post, is the catalyzing subject of this rant. It would be more like me to place this image top, front, and center on the FourthWall blog because it would get your attention more than the TNY logo will… but guess what? Unless you had more context than even my title suggests, THAT would be graphically irresponsible, creating an instant blur of meaning and message, wide open for (mis)interpretation. What is designfarm saying? Isn’t Jodi a liberal? Why is she furthering the storm over that terrible image? Doesn’t she want Obama to win? YES, she does. So, while I do love seeing Michelle in a big bad afro, it’s funny and cute, and I’m all about ‘fro’s these days… I just don’t think this is funny. It’s certainly not responsible, politically or editorially. It’s bad design, and it’s dangerous. Because when people walk by the newstands, they have no reason NOT to think that even good old liberal TNY magazine recognizes that Barak Obama MAY JUST BE A MUSLIM FUNDAMENTALIST, and his bigmouth sassy wife is PROBABLY A TERRORIST. The answer is simple, but let’s push the point, just in case. A POWERFUL, COMPLEX IMAGE WITH NO CAPTION. NO WORDS. NO INFORMATION HIERARCHY. Now, let’s open every designer’s friend, PhotoShop, just for fun, adding the cover image’s title, where, of course, it belongs. Let’s forget about fonts, placement, and other surface matters that we designers do care about but since this isn’t a real project, let’s just stick the title/caption on there, with a hierarchy that MAKES CERTAIN everyone “gets” it. I think my point is clear, if ugly. And ugly is better than confusing, any day. The New Yorker, of course, was commenting on the fear generated by rampant rumor-mongering about Barack Obama, and his wife. They stand by their decision and are not apologizing. But they should. 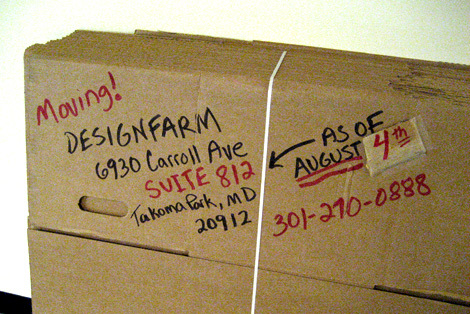 Don’t get me wrong, bad design is forgivable, no apology necessary…. when it’s toilet paper packaging, or toothpaste, and in many other contexts. Not this one. The New Yorker made a big mistake in assuming that the 1 million people they allege as viewers of the magazine every week bring a level of context and understanding to their presentation of information, to their graphic design and editorial. Well, we don’t. Not those of us who are actually thinking about the barrage of images coming at us a mile a minute every minute of every day, and certainly not those of us who are less attuned. MEMO TO THE NEW YORKER: WHAT WERE YOU THINKING when publishing potent, challenging, multi-level, complex ironic satiric visuals without accompanying text in a purposeful and clear information hierarchy? OR, ARE YOU THINKING AT ALL?